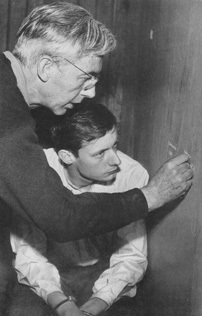 Robert Bresson began as a painter and, while he would rarely practice the art, it was a guiding force in the development of his unique film style. In a quote from a late interview with Michel Ciment after the release of his final film, L’Argent (1982), Bresson provides some interesting insight into his motivation for setting down the brush. While Cézanne was the one who showed Bresson painting was over, I believe he was also a key influence on the shape that Bresson’s film style took. The purpose of this article is to trace out this thought by comparing the similar goals Cézanne and Bresson had for their arts, and the parallels that can be found between the respective styles both created. A final brief note on the similarities of the artists’ lives will round out the discussion. The payoff will be to shed more light on the artistic influences on Bresson and, more important, to achieve a better understanding of what Bresson was trying to accomplish with his unique “cinematography”. By comparing Bresson with Cézanne we more clearly see the challenges the filmmaker faced in differentiating film from the other arts, particularly painting, and how Bresson provided the foundation for “tomorrow’s writing or painting” by using Cézanne’s style as a compass. New movements sprung up to challenge these staid styles in various forms, such as Impressionism and Post-Impressionism in painting, and Neo-Realism and the New Wave in film, but both Cézanne and Bresson found themselves as outsiders even in relation to these vanguard movements. They were pursuing very unique paths. What both Cézanne and Bresson wanted was to express as perfectly as possible the unique sensations impressed upon them by nature. With this statement, it makes sense to see Cézanne as part of the Impressionist movement. The Impressionists wanted to objectively show the real world as it presented itself to the viewer in the immediate moment, and so they left the studio for the open sky, loosened their brushwork and took on more everyday subjects. But while the movement partook of scientific approaches to optics and it claimed objectivity, the subjective was also emphasized. A painting wasn’t simply a photograph, but visual impressions of a moment coming from a single person in a single place at a single moment in time. Hence, Claude Monet’s touch looks much different from Claude Renoir’s or Camille Pissarro’s. Much of the Impressionists’ goals appealed to Cézanne and he was certainly a part of the movement, but always somewhat uncomfortably. 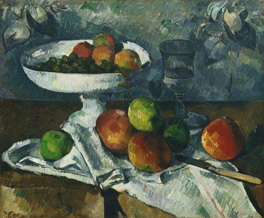 This strong commitment to expressing his sensations from a close observation of nature, sensations that had been reflected on and communicated in a direct, forceful way was the catalyst that would shape the unique style of Cézanne, particularly his parallel brushstroke, his palette and his attempt to achieve a simple, balanced order. Of course, the challenge was how to get to the heart but still convey that mystery in a direct, logical way. “Your imagination will aim less at events than at feelings, while wanting these latter to be as documentary as possible.” (16) Bresson, like Cézanne, was struggling how to convey the subjective experience of nature while remaining true to nature. Indeed, this was the path that Bresson followed, leaving the world of cinema he found himself in and turning to nature as he saw it. By looking to nature, Cézanne and Bresson found the means to present the heart of nature through their own sensations, manifest in their unique styles that appear at once natural and also strongly contrived. In the best of Cézanne’s paintings, the whole is organized so well it feels natural, but a new natural that has been brought forth by something other than nature, the artist. It is the same in Bresson. Particularly in his late films, when his cinematography was at its most developed, such as L’Argent, the viewer feels they inhabit a world of its own but one that follows the rhythm of nature. These feelings when encountering Cézanne and Bresson are profound because what both were trying to do, again, is get at something deeper than just a photographic reproduction of nature; it was the heart, or one could say truth, of nature. As Bresson commented: “I am looking for truth. Or the impression of truth.” (19) There is a big difference between wanting to show nature and show one’s sensations/impressions from meditating on nature. The latter entails an encounter between the I and the Other where the Other impresses the I and the I transforms the Other by expressing this encounter. It is at once a very mystical yet a very natural thing (for isn’t it just nature being taken in through the senses of a natural animal that has its origin in nature?). The problem is that conveying such an encounter can often be sloppy, and what Cézanne and Bresson found was the need to drastically simplify and organize their respective styles in order to convey directly, logically, these dynamic sensations. In discussing the parallels of Cézanne and Bresson, it is clear that they had similar goals in their art. But obviously they were working in different mediums and, therefore, we should expect that while their styles took on a similar appearance there is no one-to-one correspondence, for the materials of the medium are very different. This image of the filmmaker as weaver is essential to Bresson’s goals because the problem of the camera is that its mechanical nature, its “scrupulous indifference”, prevents him from conveying the real that is his impressions. The problem with cinema is that it does not make anything new, and thus Bresson sees cinema as simply documentary records of how a certain thing was carefully prepared and acted in year X. To merely reproduce nature is actually to disrespect nature, for nature by its very nature produces new things. Hence, the artist’s encounter with nature must make a new creation, not a mere copy. 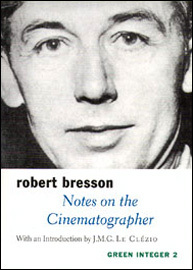 As Bresson’s experience with film grew, he realized more and more that the art of the cinematographer was not restricted only to the knotting of bits of reality on film into the unique impression of the artist, but that sound was also an essential feature, and that the real goal of the cinematographer was the orchestration of the counterpoint of image and sound into a fresh composition that conveyed the artist’s sensations taken from nature. When we look at Bresson’s work as a whole, we can see it as an evolving process of trying to figure out how to avoid the lifeless, copied reality of cinema and “capture the feeling aroused by what I see before me at the moment it occurs” (25), thus creating true art by Bresson’s definition. (26) “My films are attempts, strivings. They are striving towards something that I know to be the final truth of the cinematographer.” (27) The unique style that Bresson developed is the result of these constant attempts, and it parallels the style Cézanne developed to accomplish similar goals of capturing the reality of an encounter with nature and communicating these sensations in a clear, direct way, while taking into account the differences in medium. I turn now to a brief discussion of this similarity in style. This technique gave Cézanne’s paintings a consistency and unity that combined improvisation with a solid structure, allowing him to convey his impressions of nature in an ordered way. Bresson developed an analogous “brushstroke” to give his films similar structure, while allowing for spontaneity. This was done foremost through Bresson’s consistent camerawork and editing. For Bresson, the importance of the image is in its relationship to what comes before and after. This fact shapes his camera work, both his choice of lenses and camera movement. Since it is the relationship that matters, Bresson simplifies his images and tries to make each one un-picturesque so as not to distract the viewer from making the necessary connections. He primarily does this by flattening the image. Bresson’s use of models is essential to his purposes for numerous reasons, but here we see how their untrained voice contributes to the overall unity of the film, how their consistent intonations relate to consistent, flat shots to compose a unified whole that also is vibrantly spontaneous. And it is not only the voices of his models but sound in general in his films that creates a uniform feeling when combined with his images. It is these structural elements in sound and image, and their interrelation, that allows Bresson to convey his sensations with direct precision, the same with Cézanne’s unique brushstroke. This unique method for both artists acts as an anchor that helps to reinforce the other important elements of Cézanne’s paintings and Bresson’s films: a simple order that is balanced and unified, unique depth, rhythm and people. It comes as no surprise that the mature works of Cézanne and Bresson display a strong sense of order since this is a direct consequence of their common goals of trying to convey their own unique sensations in a direct way. Much of the order for both artists comes from the similar “brushstrokes” noted above. Two other key factors contributing to an overriding sense of order is the simplicity and balanced unity both artists achieve. treat nature by means of the cylinder, the sphere, the cone, everything brought into proper perspective so that each side of an object or a plane is directed towards a central point (44). This focus on lines and volumes creates astonishing results for Bresson: “The poetry, if there is any, comes from tautness. 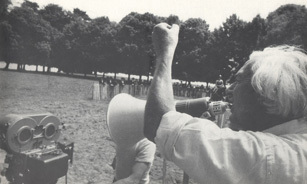 […] It arises out of my simplification, which is only a more direct way of seeing people and things.” (45) Words, actions, images are all stripped to their most basic aspect in order to fit them precisely and properly into the overall structure, and the final effect is one of very strong order. This search for balance even led Cézanne to paint still lifes that at first look clumsy and incorrect in order to create “an extraordinary sense of monumental gravity and grandeur, of everything having found its duly appointed place as in some sonorous Bach choral” (47). Bresson is likewise willing to allow for the immediate awkward appearance to gain a stronger overall unified balance. For example, there is the wheelbarrow at the end of L’Argent with the extra squeaky wheel that sounds almost cartoonish. But such a moment of exaggeration is essential to the overall balance for Bresson. Throughout his films, you can feel Bresson trying to get the right balance of this counterpoint and, when he does, it contributes to the overall complete order one feels in the film, like listening to the voices in a Bach chorale. One of the greatest accomplishments of Cézanne was his ability to convey depth without using the traditional illusion of perspective painting. “Cézanne did not aim at creating an illusion. He wanted rather to convey the feeling of solidity and depth, and he found he could do that without conventional draughtsmanship.” (49) Here again we find the emphasis in Cézanne creating a feeling rather than a simple appearance. Instead of drawing, Cézanne found that he could convey depth through his use of colour (50), particularly blue. Depth was also a concern for Bresson who, as we have seen, jettisoned deep-focus camera work for flat shots that would edit well. How could depth on the screen be recreated without loosing the benefit of the flattened images? Again the answer came by giving attention to the dynamics of sound and image in interaction. Bresson finding depth in sound was as unusual as Cézanne finding depth in colour, but it worked and worked marvellously, although this magnificent accomplishment is diminished for both artists when their works are seen out of context, Cézanne’s paintings in reproductions and Bresson’s films outside of a cinema with a well-equipped sound system. Another difficulty Cézanne faced was the possibility that his uniform brushwork and his attention to essential, basic forms could drain the picture of any vibrant rhythm and movement. However, again he overcame this brilliantly by studying the works of the great masters such as Peter Paul Rubens, Jean-Baptiste-Siméon Chardin and Baroque art to discover “an inner, generative rhythm within a motif […] of reciprocal curves and configurations” (53). This is most apparent in his great still lifes and late portraits. Bresson’s severe formal structure – in his editing, camerawork and sound – also faced the challenge of feeling too banal, empty of any generative rhythm. This need for rhythm was well noted by Bresson: “The omnipotence of rhythms. Nothing is durable but what is caught up in rhythms. Bend content to form and sense to rhythms.” (54) There were three key ways he was able to create rhythm in his films: editing, repetition, sound. Bresson’s editing, especially in his later work, hardly draws attention to itself by neither being too rapid like much of today’s films nor too slow with lots of long takes. It has the feeling of a wave that continues the same motion but is gradually moving with the tide. Like Cézanne’s brushstrokes, the editing provides a consistent rhythm. However, more dynamic rhythms are created by repetitions with subtle variety. “All those effects you can get from repetition (of an image, of a sound).” (55) We especially see this in Bresson’s use of doors and his “establishing shots”, such as focusing on the feet of a character before we see them. But it is not only in repeated images but in repeated movements by characters, particularly in their coming and going and in their “looks” at each other which give the film a certain vitality. Third, it is again with sound that Bresson achieves his most unique effects. “The noises must become music.” (56) The noises create their own unique rhythm for the film when combined with the editing and repetition. So, within an apparent stillness, even banality, there is a feeling underneath of surging movement, just as in as in Cézanne’s paintings. In the 1890s, Cézanne executed a number of paintings of local peasants that rank among the greatest portraits of all time. The magic of these portraits is that Cézanne was able to use his strong sense of form and shape, coupled with his consistent, organizing brushstroke, to actually bring out the humanity of the subject, at the same time avoiding a negative rigidity. For example, his “Woman with a Coffee Pot” is dominated by verticals, giving the picture a stately strength that parallels the dignity of the sitter. While there is a superficial mask-like quality to these portraits, there is something conjured up from within them that makes us feel their humanity more than the ultra-slick portraits of Ingres. It is here that we find one point of intersection with Bresson who was, of course, well known for his use of non-actors as “models”. For Bresson one of the key problems with actors was that they “effect projection”. “That is his movement: he projects himself outside. While your non-actor character must be absolutely closed, like a container with a lid. Closed.” (57) Like Cézanne, Bresson keeps the surface of his people general, almost blank, another element of simplicity that allows for the more direct communication of the object being sensed. We have seen how parallels can be drawn between the goals and methods of Cézanne and Bresson. Both wanted to convey the unique sensations they had from nature as directly as possible. Bresson had turned away from painting because he felt that Cézanne had already reached the end of what painting could do. Turning to film, he found it had undiscovered potential, but like Cézanne he had to fight the sterile status quo. His unique film style is a testament to this fight and, hopefully, I have shown how his style mirrors that of Cézanne in its sensitivity to nature and sensations, while expressing itself in a logical, ordered way, all the while taking into consideration the differences in media. Robert Bresson was similarly always an outsider in the world of film, acknowledged by many but followed (and funded) by few. This isolated position was apparent early on, even after making Pickpocket, when he was asked in an interview, “Do you feel alone?”, and he sadly replied, “I feel very alone, but I don’t derive any pleasure from that feeling.” (64) The situation did not improve because Bresson only released eight films in the next twenty-four years and was silent from 1983 to his death in 1999, even though he had projects he wanted to do such as his Genesis. Michel Ciment, “I Seek Not Description But Vision: Robert Bresson on L’Argent”, in James Quandt (Ed. ), Robert Bresson (Toronto: Toronto International Film Festival Group, 1998), p. 509. Paul Cézanne, Letters, fourth edition, John Rewald (Ed. ), translated by Marguerite Kay (Oxford: Bruno Cassier, 1976), p. 305. Mary Tompkins Lewis, Cézanne (London: Phaidon Press, 2000), pp. 28-9. Robert Bresson, Notes on the Cinematographer, translated by Jonathan Griffin (Copenhagen: Green Integer, 1997), p. 110. Hugh Honour and John Fleming, A World History of Art, seventh edition (London: Laurence King Publishing, 2005), p. 703. Paul Schrader, “Robert Bresson, Possibly”, in Quandt, pp. 493-5. Robert Bresson, interview by Christian Defaye, Télévision Suisse Romande – Spécial Cinéma, 1983. Robert Bresson, interview by Alain Bévérini, TF1 International, 1983. Jean-Luc Godard and Michel Delahaye, “The Question”, in James Quandt, p. 474. 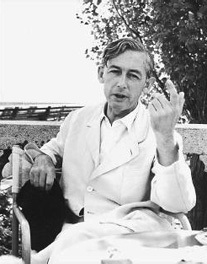 Robert Bresson, interview by Alain Bévérini. One could argue from Bresson’s own words that in order to understand him, what he is trying to do and communicate, it is essential to see all of his films, if possible. “Thus the other day someone asked me the question, ‘Do you believe that a single film of yours could affect people?’ It can, perhaps, affect some people, but I do not believe that a single painting by Cézanne has made people understand or love Cézanne, has make them feel as Cézanne did. It takes a great many paintings!” Godard and Delahaye, p. 458. Robert Bresson, interview by Christian Defaye. “Now, I believe very much in intuitive work. But in that which has been preceded by a long reflexion.” Godard and Delahaye, p. 456. It should be noted again that this style develops in Bresson and thus in earlier films more variety in camera work can be seen, although still very little compared to mainstream films. E. H. Gombrich, The Story of Art, sixteenth edition (London: Phaidon Press, 1995), p. 542. Quoted in Lewis, p. 294. Hugh Honour and John Fleming, A World History of Art, seventh edition (London: Laurence King Publishing, 2005), p. 730. “Color must reveal every interval in depth […]” Cézanne quoted in Honour and Fleming, p. 732. 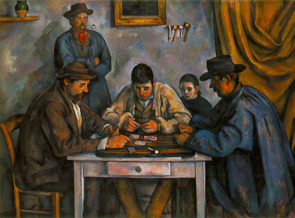 Cézanne, 301. It is interesting that Bresson makes a comment about Cézanne’s use of blue in reference to its ability to unify the composition. He draws a parallel with his editing: “Cutting. Phosphorus that wells up suddenly from your model, floats around them and binds them to the objects (blue of Cézanne, grey of El Greco).” Bresson, Notes, p. 86. Godard and Delahaye, p. 466. Godard and Delahaye, p. 471. Robert Bresson, interview by Mario Beunat, Page cinema, 1962. In Gayford, Martin and Karen Wright (Eds), The Penguin Book of Art Writing (London: Viking, 1998), p. 295. Rilke’s comment on Rodin’s sculpture could be applied to Bresson, that it “was an art ‘to help a time whose misfortune was that all its conflicts lay in the invisible’” (p. 721). Robert Bresson, interview by France Roche and François Chalais, Cinépanorama, 1960. Peter Doebler is currently doing independent research on the relationship of the arts at Trinitiy College, Dublin. He holds an M.A. from Wheaton College in Biblical Studies. His primary research interests include Silent Cinema, 1930s Japanese film and early film theory.